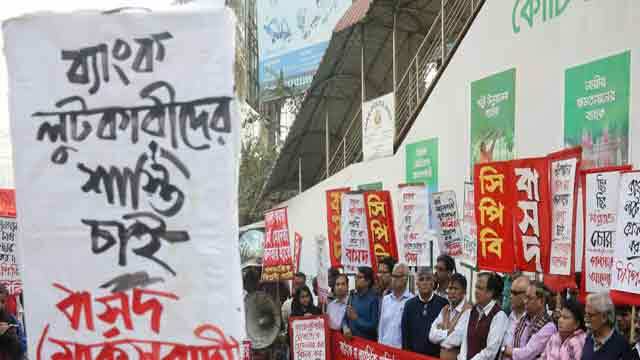 Dhaka, Jan 24 (Just News): Country's scheduled banks and financial institutions have failed to realise some Tk 65,602 crore default loans over the last 10 years from the big borrowers, each of whom had taken loan amounting Tk 10 crore or more. Finance Minister AMA Muhith told Parliament on Wednesday that it was not possible to collect Tk 65,602 crore against the defaulters who took Tk 10-crore plus loans. According to the latest CIB database of Bangladesh Bank till November 2017, some 8,791 persons and organisations took Tk 10-crore plus loans from the scheduled banks and financial institutions in the last 10 years and the total amount of the big loans is some Tk 6.06 lakh crore, the minister said responding to an unstarred (written) question from independent MP Rustum Ali Faraji (Pirojpur-3). The number of defaulted persons and organisations is 1,956, while the total amount of default loans is Tk 65,602 crore and the total amount of classified loan is Tk 72,050 crore. Muhith also placed a list having names of 1956 top defaulters of all banks and financial institutions. The first ten names are Mohammad Elias Brothers (Pvt) Ld, Marrine Vegetable Oil Ltd, Quantum Power Systems Ltd, Max Spinning Mills, Benetex Industries Ltd, Anowara Spinning Mills, Chowdhury Knitwears Ltd, Siddique Traders, Yasir Enterprise and Alppa Composite Towel Ltd. In reply to a supplementary question from the ruling party MP Shamsul Haque Chowdhury, the Finance Minister said, "The number of taxpayers is 31 lakh in the country. It is shameful for the country as the number of taxpayers should be at least 1.6 crore ones among the 16 crore people of the country." Muhith said the government has a target to increase the number of taxpayers at 50 lakh by 2021.